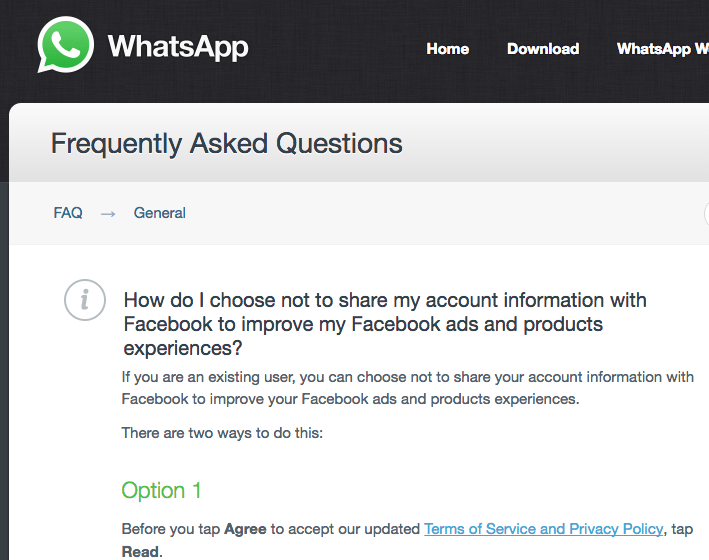 WhatsApp, Data-Sharing & Advertising: What Should Users Do? The writing was on the wall. 2 years ago, Facebook acquired WhatsApp in a huge deal. A long wait followed to see when and how Facebook will begin to monetise the huge amount of user data that it acquired along with WhatsApp. It follows that all these information, including the embarrassing or undesirable, is archived somewhere (even though there is supposedly end-to-end encryption). The primary criteria for mining information is mileage for advertising. (1) Users need to be continually vigilant on what we share on any social media platform - embarrassing information will not disappear or be deleted. Young children are especially vulnerable because most sites they use collect information for advertising. In the next 30 days, Facebook (WhatsApp) will offer the chance to opt-out. Take 3 minutes to do it. (3) Back to Step 1 - continue to be vigilant because it is unlikely that this will be the last attempt to monetise user data. This comment is an opinion & not yet a fact - like we first talked about the possibility of data sharing with Facebook 2.5 years ago. However, current business models of most social media platforms (Snapchat, Google, Facebook etc) point to a likely & continual attempt to maximise monetisation & alter users' notion & expectations of privacy.